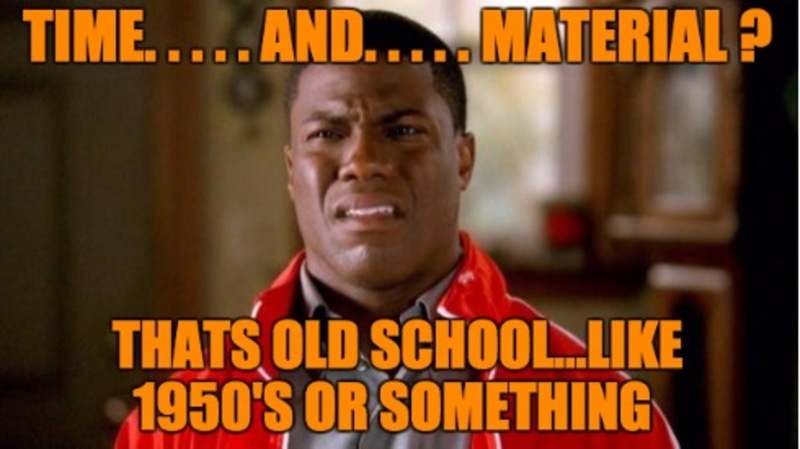 Didn't They Use Time And Material Back In The 50's? Have you ever considered going flat rate with your company? (Also known as Menu Pricing, Upfront Pricing or Value Rate Pricing.) I have talked with many service companies who are still stuck on T&M (time and material) pricing. They have called flat rate pricing the “book of lies” and the most common reply back is “My customers can’t afford flat rate prices” and “You rip people off when you charge flat rate prices!” That is like saying “A corvette will go 200mph, I’ll go 200mph in that car and get a ticket if I drive it”. Drive it the speed limit and you won't get in trouble! There is some automatic, negative, defensive brain click when contractors hear "Flat Rate". It’s time to leave that stagnant T&M pricing behind and start charging the professional rate you deserve, unless you're a 501(c)(3)​ non profit service company. Before you continue reading, put yourself in your “customer's position”. Not how you would react, but how the majority of your customers would react. Your customers want to know how much it’s going to cost before you start the job. Plain and simple. First of all, the customer is inviting a complete stranger into their house and they are on the defense. Second, unfortunately service contractors don’t exactly have the best reputation. So if you’re coming into their house shooting from the hip with prices off the top of your head, the customer will most likely turn your “scratched head estimate” into a “hey, thanks for coming”. Picture this - You greet your customer with ma’am or sir with a business card in hand and a big smile. You’ve eliminated the “stranger” mentality with that customer. You now put on shoe booties. You are showing respect for the customers house; building trust. You have the customer show you the problem and then you sit down with the customer to go over prices. At that point, your building confidence with the customer and you’re not guessing prices and ripping them off. As you are going through your flat rate price book you begin to build your relationship with that customer. You then ask the customer if they would like to conference call their spouse to go over the prices. What has just happened here?? You are including another person into the conversation and now the customer is at a 110% trust level making the sale that much easier. The reason for the phone call… you want a “yes” before you leave the house. If they say no to the phone call, it’s now a waiting game. BUT, you are still that much further ahead than every other contractor that came into that house. People want peace of mind. People want to sleep at night. They want to know that if a problem or repeated problem occurs again that you will take care of the problem. People will pay for peace of mind. Nowadays gas companies are selling “Peace of Mind” to all their customers. The gas company is responsible up to the meter, BUT, YOU ARE RESPONSIBLE FOR GAS LEAKS IN THE HOUSE! For a certain price they will take care of the gas lines in the house “if” there is ever a gas leak. Paying $25 per month gives people peace of mind. When you go to the big box stores after buying a flat screen t.v. or expensive electronic device, what is always offered? A 3 or 5 year extended warranty on top of what the manufacturer already gives. People will pay you for a $200 service contract that includes lifetime labor warranty, lifetime faucet warranty, extended warranties, to be put first on the list for service calls, free annual house inspections, no overtime or travel charges and whatever else you can come up with. WHO WOULDN’T!! I’d sell myself one! What happens if I don’t go flat rate? You remain right where you are at. "Nothing will change if nothing changes." You have spent a lot of time and money getting that contractors license. You are now considered an expert skilled practitioner. You’re licensed... right? Then you are an expert skilled practitioner! It’s time to start acting professional with professional looking prices. Being a professional means that you have bills to pay, insurance to maintain and employees to take care of. Within your flat rate price should include everything it takes to stay in business and make a profit. The Profit Generator on the LPSolutions website will give you all this information right down to the penny. When I had my company and before I switched over to flat rate in 1999, I was charging $65 per hour. When I figured out my “Honest, no holds barred” hourly rate, it came to $114 per hour. With a 3% cost of living charge since 1999, my hourly rate today would be $172.14 per hour. If you want to take your company to the "expert skilled practitioner level", click on this link for the profit generator or click on this link for the flat rate price book.